Cutting Concrete Piles Service- Call the Experts Now! Cutting concrete piles is no easy task but Waterford demolition can provide the pile cutter equipment and workers to do this no matter how many piles are required to be cut down. 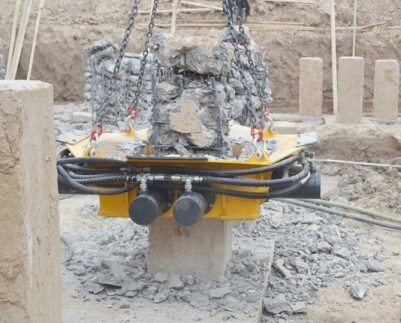 We use superior pile cutting equipment & technology that is the safest, most cost effective and labour saving method of cutting concrete pilings for any demolition projects. Our machines can be use on uneven surfaces, and a unique system of clamps makes preparatory pile cropping unnecessary, saving on both time and costs. Waterford Demolition Ltd recently undertook a large project with Genzyme in Waterford where 100 piles had to be cut. And we have also undertaken other similar projects with construction companies such as Sisk Construction to remove concrete piles. We take on small and large projects and deliver every project with a high level of professionalism and integrity.